You are here: Home / Apple / Which are the top iPad applications for Art Lover? Which are the top iPad applications for Art Lover? Now all the art lovers can stretch their creativity and imagination through the applications of iPad. It is a creative tool for the ones, who are interested in creative fields. From sketching to drawing, they can do everything related to art. The difference is just that this can be done digitally. You can learn about artists and their creative projects through the fantastic applications of iPad. 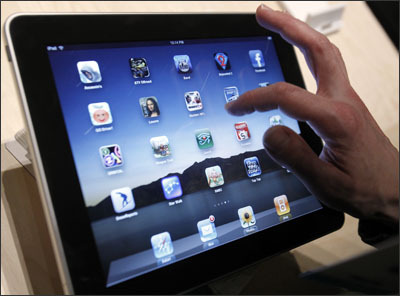 Yes, you can enrich your iPad memory with the best applications for designing, drawing, sketching and painting. Just like professional artists, you can come up with incredible master pieces. Check out the description of these powerful applications as follows. If you are a digital artist, then do check out Sketchbook Pro. It is one of those applications that an iPod must have. Using this application, you can choose digital markers, air brushes, pens and pencils. You can even create your own through its multi touch interface. This will give a beautiful art work. This application is very easy to download and has sixty preset brushes. One can install an additional ninety brushes and also stamp brushes. If you love to paint then go for digital painting. Simply check out Inspire Pro. While using this wonderful application, you will feel that you are truly painting on a canvas and as if you are using wet oil. This application features five paint brushes that are very realistic. You can either choose the round and fan brush or a flat brush. The amount of pressure that you will apply on the screen while create blending effects incredibly. All those who have been using Photoshop, can enjoy using ArtStudio. It is the best application for art lovers. This application offers text tool, clone tool, layers, 30 brushes and filters. You can even enjoy the drawing lessons that this application offers. These lessons include humans, animals and 3D. At times we want to collect our thoughts and we want to save them somewhere. The Penultimate application is the best handwriting application. It helps you to jot down and sketch the ideas within minutes. This application offers three kinds of photorealistic paper styles and you can even create your own template by importing an image. There is a Paper shop present in this application and it allows the user to buy upgraded paper. Boost your creativity and productivity, download Penultimate immediately. The art lovers, who are familiar with Adobe Illustrator, will enjoy this vector illustration and drawing application, named as iDraw. It has fully customizable margins and grids to vector brushes. One can even use tools to draw customizable designs. Layers can be used to draw designs and images and one can share those designs later on. This application makes one feel as if he or she is working on desktop computer. Vilma Jones wants to provide some useful tips which would be quite beneficial to smooth the way of Test4prep exam clearance. Would you like to go through CompTIA Certification guide self assessment tutorials.